Our specialty is servicing any type of front load /rear load dumpsters, roll-off containers, compactors, recycling cans and portable toilets associated with waste hauling. 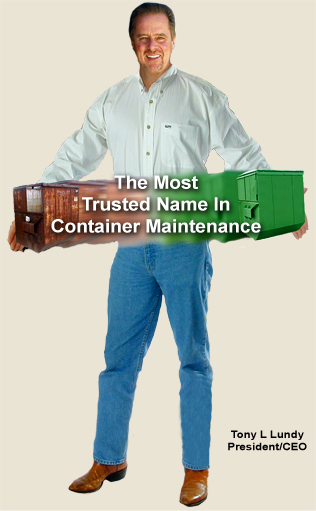 Mobile Container Service, Inc. will provide a team of highly trained technicians using a self-contained repair and painting system to completely refurbish your containers at a designated centralized facility or at satellite yards/routes. Under a hub and spoke operation major repairs can be preformed at a centralized facility, to include bottoms, major welding, as well as painting. While mobile crews are out servicing containers on route or at your satellite yards that only need minor repair/paint. With this unique feature of Hub and spoke, your company will be spared the expensive and time consuming task of transporting most containers that just need minor repairs. Some of our national customers have determined our on-site service has reduced container maintenance cost by as much as 60%, enabling them to better service their fleet of rental containers. Waste and scrap metal hauling companies are examples of the customer who are utilizing this much-needed service. Even companies that operate their own in-house maintenance facilities have found substantial savings using our services to complement their own program. They call us to work with overload situations caused by seasonal in-fluxes, personnel changes, special projects or rapid growth. Copyright ©2008 Mobile Container Services, Inc., all rights reserved.